I didn’t get the NaNo board finished yet, but it’s coming along. The calendar, Magna Carta I & II, and some visuals have been completed. The goal is to finish it up this weekend so I can hang it above my desk by Monday. In the meantime, I’ve already set up Liquid Story Binder XE for my newest novel by resetting my global work logs from last year’s and preparing my Planner. I’m doing things a bit differently by incorporating Builders. The reason is that this time around, I’ve actually prepared a mind map for this particular novel—something I didn’t have last year (I flew by the seat of my pants). Right now I hope to write as much as possible because I want a nice comfy cushion when those lean writing days arrive…and I know they’re coming. I’d also like to keep a daily writing journal and post over at Today, I Wrote… (which is desperately in need of some love) as I go along. I hope I won’t become too preoccupied. If you’re also participating in NaNo, buddy me. You can never have too much support. In less than a week, the mass month-long caffeination of hundreds (possibly thousands) or writers worldwide will begin. 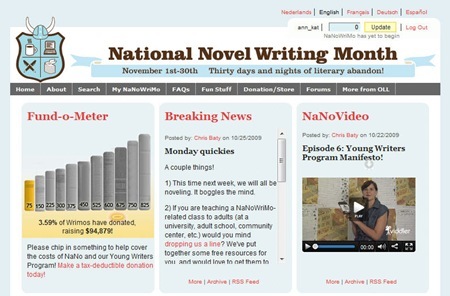 Yep, I’m talking about National Novel Writing Month, aka NaNoWriMo, where the participants are asked to complete a 50,000 word novel in 30 days’ time. But learning from past experience, this year, I’m going in with (more of) a plan. My brain likes structured chaos—you know, the stuff that looks like a hodgepodge but is really organization in disguise—and highly visual stuff—big and colorful so I can’t miss it. The light bulb flickered on for me when I saw the extra 24×36 in. poster frame I had stashed in the corner of my room. I thought, “Hmmm, that’s big enough to fit a whole bunch of bright colorful stuff on. (sound of mental gears grinding. )” Story collages, mind maps, the magna cartas, inspirational quotes…a calendar…all smooshed together. BAM! The NaNo board idea was realized. Epicenter = mind map. A few months ago I came up with a story idea and drew up a mind map on an 9×12” sheet of paper. Magna cartas on either side. No Plot? No Problem? (links to my review) discusses creating two magna cartas (aka lists), one detailing everything you like in a novel and the other detailing everything you hate. 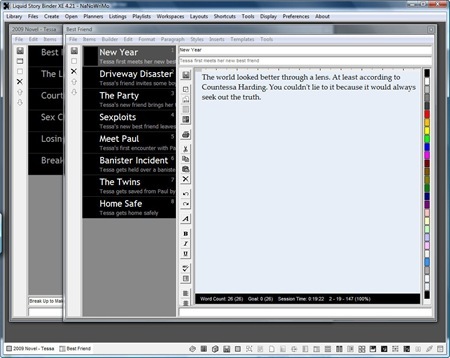 During the next few days, I hope to finish, in addition to the chaotically structured NaNo board, my novel folder which will include character dossiers, location samples (i.e. maps, descriptions, random town facts), and fleeting bits of dialog. When it’s all set up, I’ll be sure to take pictures and update. Meanwhile, I need writing buddies. Hit me up please.